8 loyalty points Your cart will total 8 points that can be converted into a voucher of 0,32 PLN. 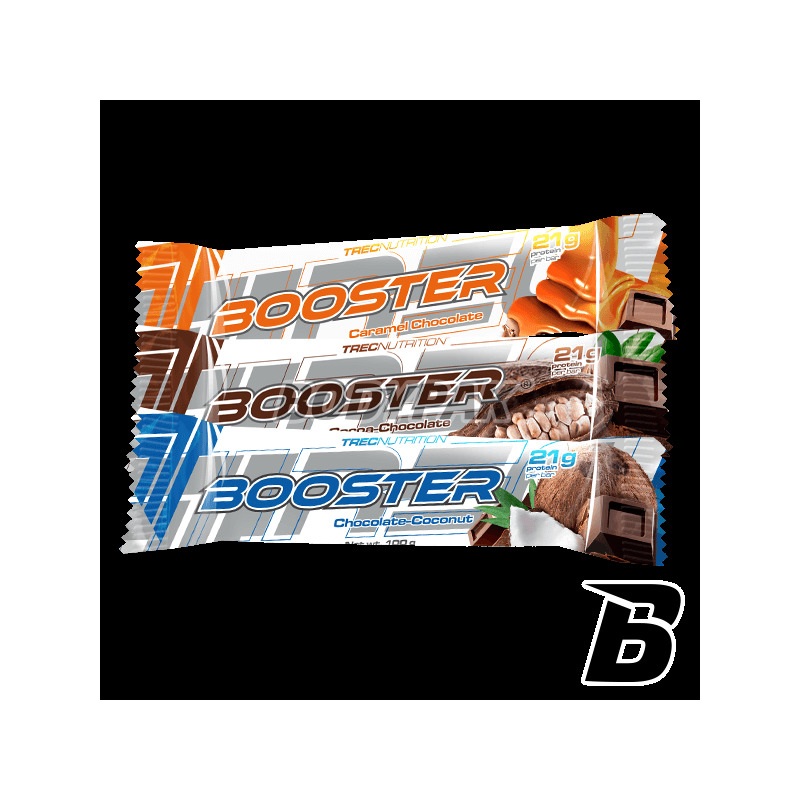 Trec BOOSTER is a high-protein Baton, which will provide you with everything you need to function properly: 21g of protein per serving, fats, essential fatty acids, vitamins and the amount of energy for a long time. Not be overlooked the fact that the protein source is whey protein concentrate! You will not find it in fractions of plant origin - only complete protein of animal origin. Called "essential fatty acids" are hiding esencyjne fatty acids (ie. Valid for life), which are a natural source of easily digestible energy and vitamins A, D, E, and K. Usable fats during the production of this excellent bar only come from natural sources (peanuts and cocoa solids). 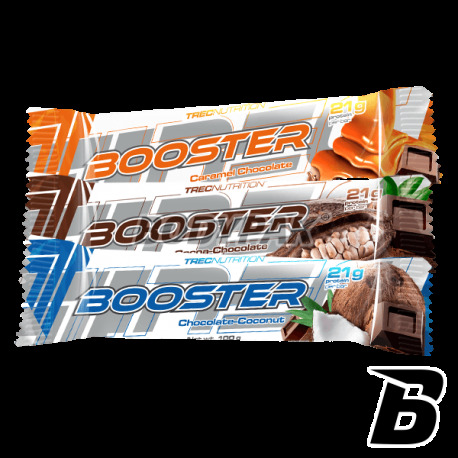 Trec BOOSTER is an ideal meal replacement, whose composition is complete. If you are a hard-training athlete or looking for a delicious variety restrictive diet should take into account that bar in your diet. TREC BOOSTER - TASTY FOR PURPOSE! Składniki: miazga orzechów arachidowych (orzechy arachidowe; cukier); polewa czekoladowa (miazga kakaowa; cukier; tłuszcz kakaowy; kakao w proszku; lecytyna sojowa, polirycynooleinian poliglicerolu - emulgatory; aromat); koncentrat białka serwatkowego (z mleka); olej roślinny, cukier, sorbitol - substancja słodząca; mleko w proszku, aromat, sorbinian potasu, benzoesan sodu - substancje konserwujące; azorobina - barwnik. Smak karmel jak dla mnie to ogromny zawód :( baton totalnie bez smaku, bardzo nijaki, a w dodatku bardzo kaloryczny :( Nigdy więcej! Istna bomba kaloryczna! Zastąpi raczej cały posiłek niż jest przekąską, chyba że ktoś dysponuje sporą pulą kalorii, którą ciężko mu przejeść. Pożywny i smaczny baton, który polecam nie tylko sportowcom, lecz też survivalowcom. Chyba najsmaczniejsze batony, a na pewno najsmaczniejsze wśród tych bez cukru w składzie. Polecam owoce leśne. Very tasty and valuable oat cereal bar with increased dietary fiber content! Makes it ideal as a healthy snack and variety to the monotonous diet. Excellent source of energy between meals!